Many people struggle to lose weight, trying everything from fad diets to crazy workouts to the latest cleanse. 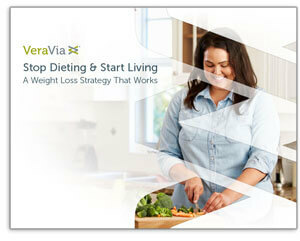 At VeraVia, we believe the only way to achieve healthy weight loss is by addressing the whole person. In this guide, we give you the tools you need to begin your weight loss journey and realize true, healthy weight loss. It’s time to stop trying to lose weight on fad diets and start living your life. Get your copy of Stop Dieting and Start Living. Download Now!